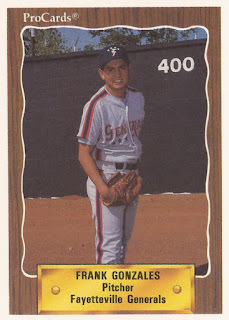 Frank Gonzales played professionally for nearly a decade. At the end, he went to be with his family, he told Gonzaga Magazine in 2013. Among his tasks on his return: Work with his son Marco. "I knew by then I wasn’t going to make the Majors," Frank Gonzales told the magazine about his final season playing in independent ball. "Gina (Gonzales' wife) would send me video tapes of Marco pitching and playing shortstop. He was 6 years old. I was pitching OK, but seeing him play made me decide to pack my bags and come home." Frank Gonzales' work with his son paid off in 2014, when the Gonzaga product Marco Gonzales made the majors with the Cardinals. The father made it to AAA in a total of five seasons. He never made the majors. 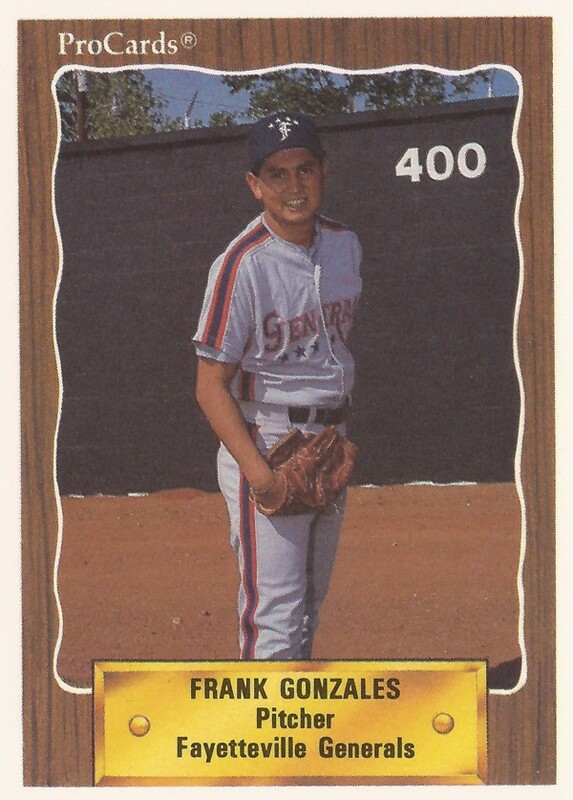 Frank Gonzales' career began in 1989, taken by the Tigers in the 16th round of the draft out of Colorado State University. Gonzales started his career at short-season Niagara Falls in 1989. He went 3-3, with a 3.79 ERA. He then moved to single-A Fayetteville for 1990, then high-A Lakeland for 1991. He topped 10 wins both seasons. Gonzales then split 1992 between AA London and AAA Toledo. In July, Gonzales pitched into the seventh inning of a game, giving up 13 hits but just two runs. In another outing that month, he went seven innings, striking out seven for the win. Gonzales played for Toledo over four seasons, staying through 1995. He eventually moved from starting to relieving. He picked up three wins and a 3.31 ERA over 49 relief outings in 1995. After not being recorded as playing in 1996, Gonzales returned in 1997. He played at AA with the Red Sox, AAA with the Pirates and at independent Elmira. He then returned to Elmira for 1998 and played 1999 at independent Somerset, ending his career. Gonzales then soon got into coaching. He headed the Colorado State club team, as well as in high school. In 2013, he moved to the pros, serving as pitching coach for the Tri-City Dust Devils. He manged at short-season Boise in 2015. In 2016, he's set to head rookie Grand Junction for the Rockies. In 2014, Gonzales' son Marco made the Cardinals, a year after being taken in the first round of the draft. "I was probably the most nervous when I saw him walking with Yady (Molina) out to the bullpen," Gonzales told The Denver Post after his son's major league debut. "That is a really, really humbling picture to see your son walk out onto a big-league field."